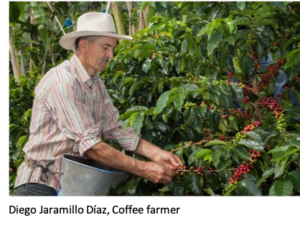 More than four hundred smallholder farmers in the municipality of Jardin in Colombia have chosen 4C certification to grow coffee more productively and sustainably. They are all members of the De Los Andes Cooperative, a non-profit organization founded in 1961, which is committed to ensure that growers receive a fair share for their effort. 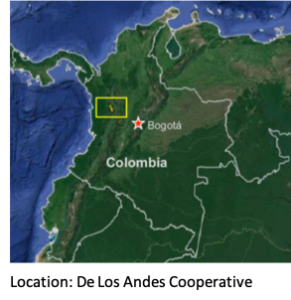 The cooperative is located in Andes, Antioquia, one of the major coffee growing regions of Colombia. The Cooperative has been involved with 4C since 2014. Farmers are proud to participate in an international sustainability certification program such as 4C, states Maria Hernandez, Project Director at the De Los Andes Cooperative, as 4C targets sustainability through taking care of the environment, water resources, reforestation and soil conservation as well as looking at social aspects such as good working conditions and respect of human and labour rights. “4C makes the farmers more aware that they have a business which needs good administration and improvement plans to comply with market requirements. Also, 4C is demanding in terms of training, not only for the owner or manager of the farm, but also for workers and the staff on the farm”, outlines Maria the benefits of the 4C System for the farmers. Through continuous improvement plans which have to be set up by 4C certified units, impact on the ground with regard to environmental, social and economic sustainability is generated. Support with technical assistance is provided by the De Los Andes Cooperative to its farmers to facilitate the implementation of the measures stated in the improvement plan. For example, with regard to the 4C requirement to conserve and use water resources efficiently, the Cooperative promotes the installation of the best value water treatment system, which have been tested to comply with local regulation. Technicians from the Cooperative provide the farmers with a list of materials and show them how to get the water treatment up and running. The Cooperative also searches for co-funders that would like to help with finance. 4C is continuously working on increasing and better measuring the impact of 4C certification on the ground. Constant dialogue with its certified coffee units provides 4C valuable insights on where further support is required. The Cooperative is the first coffee growing cooperative using GRAS (Global Risk Assessment Services), a web-based tool based on remote sensing and GIS technology which provides comprehensive sustainability-related geo-referenced information on biodiversity, land use change, carbon stock and social indices. Occurrence of land use change can be verified by provided heat maps and using a simple to interpret greenness index called the Enhanced Vegetation Index (EVI), which allows to identify the history of the land use and to detect the exact point in time of land use changes. 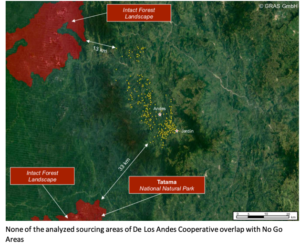 416 coffee farmers of the De Los Andes Cooperative have been analyzed by GRAS with respect to biodiversity, potential land use change, carbon stock and social indices using a semi-automated methodology for sustainability risk assessment. Based on the assessment, the overall GRAS Index has been calculated in order to identify farmers with a high sustainability risk and to exclude those farmers from certification which have been involved in e.g. the conversion of primary forests. Thus, the tool supports the establishment of deforestation free coffee supply chains, which is more and more requested by the markets. Auditors can use it for risk analysis prior to certification. Trainings provide the farmers with the knowledge to prevent further deforestation. Colombian coffee is renowned worldwide for its individual taste and quality. Its unique properties have been given protected designation of origin status by the European Union. The smallholders in the Jardin area produce very good quality Arabica coffee from their farms, each of which is less than five hectares. With 4C, consumers know that one of their favorite coffees will benefit small growers and the environment. De Los Andes is committed to expanding the market for 4C coffee and spreading its messages of ethical and responsible production to the four corners of the world. The De Los Andes Cooperative is the result of the combined efforts of more than 3,600 members, who work every day to generate a better future and achieve sustainable development in the field. 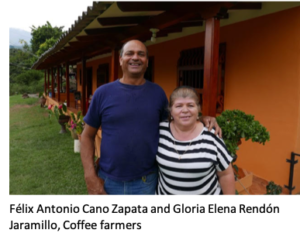 On 1200ha of farm land, a subset of more than 400 members are producing 4C compliant coffee with an annual production capacity of 2200 metric tons. Their mission is to actively participate in the sustainable development of the coffee growers, their family and the region. The Cooperative is steadily growing with new associates continuously trained in the principles of working in a cooperative. 4C (Common Code for the Coffee Community) was developed in a comprehensive and transparent multi-stakeholder process involving coffee producers, trade and industry as well as various civil society organisations from around the world. The aim of 4C is to move the entire coffee sector towards sustainability. The 4C certification system includes requirements for economic, social and environmental conditions for coffee production and processing in order to establish credible sustainable and transparent supply chains for the coffee sector. Independent certification bodies verify compliance with the 4C requirements. 4C operates in 28 countries and is one of the largest certification systems in the coffee sector.